Oliver Milton Lee (1865-1941) – Rancher, law officer, probable outlaw, state legislator, and businessman, Oliver Lee was the son of a California 49’er from New York. He was raised in Buffalo Gap, Texas and his father died when he was just 12 years-old. At the age of 19, he and his older half-brother, Perry Altman, led their widowed mother and the rest of the family to New Mexico’s Tularosa Valley. For the first several years, the half brothers worked on local ranches to save up their money and in 1893 purchased land in what was called Dog Canyon. 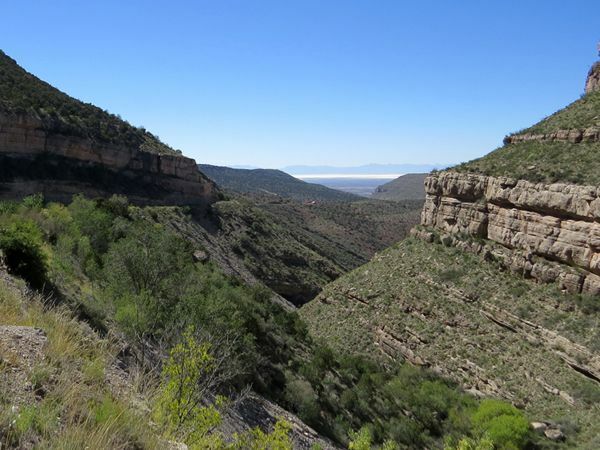 The area was an ideal spot for a ranch as it was a steep, narrow canyon with a flowing stream. 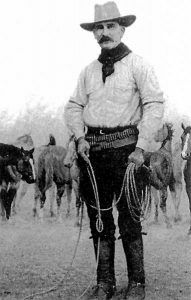 Lee first began his ranching operation, primarily raising horses before adding cattle. He soon became famous for his abilities as a marksman and a cattleman in southern New Mexico. At the age of 22, he organized the Sacramento Cattle Company in the southern part of the Tularosa Basin. Though all appeared to be working in Lee’s favor, the ambitious young man soon found himself in a conflict with a major local rancher named John Good. Oliver Lee had sent one of his ranch hands and good friend, George McDonald, into Dog Canyon to round up some stray cattle. However, George never returned and his body was later shot and killed in the canyon. Lee procured one of the bullets that had killed McDonald and carried it on a watch chain. Lee believed that John Good’s son Walter killed his ranch hand George McDonald. In mid-August, 1888, Oliver Lee and three other men jumped and captured Walter Good, shot him twice in the head with his own pistol and left the body in the desert. Two weeks later in August, 1888, John Good accompanied by 15 relatives and employees discovered his son’s body. Leaving two men to guard the decomposed corpse, Good sadly told his party to disperse. As Good and five men rode toward Las Cruces they saw Milton Lee, Perry Altman and two other men. The immediately rode toward Lee’s group, which rode into a ditch and opened fire when Good’s band drew within 150 yards. Good and his men then fled into a corn field. Before the shooting stopped more than a hundred rounds had been fired but luckily no one was hit, with the exception of two horses killed. Lee continued this retaliation by shooting at the Good family at their son’s funeral. This started the Lee-Good range war where gunfights broke out with regularity. Oliver Lee was one of four men charged with Walter Good’s death and Lee was arrested; however, he was released when prosecutors could not find anyone to testify against him. After Lee was released from custody, he began to make great strides in extending his ranching enterprise, eventually building a prosperous spread. Within a year Good had taken steep losses and decided to leave the Tularosa Basin for good. Somewhere along the line, Oliver Lee married Winnie P. Rhodes of Dona Ana County, New Mexico and the couple would eventually have nine children. He also secured appointments as a deputy sheriff and as a U.S. Deputy Marshal, but he increasingly came under suspicion in the mysterious murders of A.J. Fountain and his 8-year-old son in 1896. Governor William T. Thornton hired Pat Garrett, the famous lawman who killed Billy the Kid, to solve the Fountain murder case. The governor also hired Pinkerton detectives to help Garrett, and local friends of the Fountains hired their own detectives to find the killers. A posse including Pat Garrett tracked Lee and James Gilliland, also suspected of the murders, and on July 13, 1898, surprised the two fugitives just south of Alamogordo, New Mexico. Lee and Gilliland outshot and outwitted the posse, who finally withdrew. Later; however, the two surrendered. Despite the fact that the territory was certain Oliver Lee was responsible, the evidence against Lee was circumstantial. Three years later reporters from national newspapers covered the sensational murder trial of Oliver Lee and James Gililland in the little mining town of Hillsboro, New Mexico. After an 18-day trial with 75 witnesses, the jury’s determined that the men were innocent. The murder and disappearance of Albert Fountain and his 8-year-old son Henry near White Sands in 1896 is one of the great, unsolved mysteries of the Southwest. Lee returned to tending his Dog Canyon Ranch. In 1914, he sold out to a group of businessmen but stayed on as manager. Later, he was twice elected to the state legislature and he served as an officer and director of numerous business organizations until his death in 1941 of a stroke. By Kathy Weiser-Alexander, September, 2017.